When it comes to the perfect cocktail of whimsy and joy, Kate Spade gets it right every single time. And the designer’s New York Fashion Week Fall 2013 collection was no exception. We saw lots of juicy color, playful prints, and sparkling metallics. 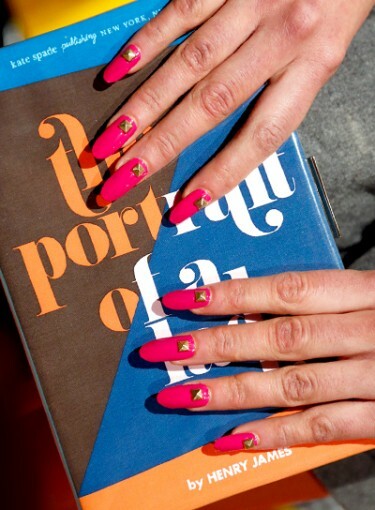 Kate Spade makes it pretty hard to choose just one favorite thing, but we are obsessing over these rocker-chic nails created by Deborah Lippmann. Also, we were totally fooled by this picture at first. It looks like the model is holding a copy of "The Portrait of a Lady" by Henry James, but it is actually a clutch! A Kate Spade Fashion Week show is always full of surprises. 1. Start with two base coats of Deborah Lippmann’s opaque pure white in "Amazing Grace." 2. Let this dry completely, then follow with one coat of Deborah Lippmann’s hot pink "I Kissed a Girl." Let this dry. 3. Finish with a final layer of Deborah Lippmann’s fuchsia in "Between the Sheets." 4. Once your nails are completely dry, apply a drop of nail glue to pyramid studs. Place each stud at the center of your nail, just above the cuticle. Press firmly and wait to dry. *Note: You can buy these pyramid studs in packs at your local craft store or on Etsy.